The Cowboys continue their Big 12 schedule with Kansas. They head into the Phog with a 9-13 record (2-7 Big 12) coming off a very close loss against TCU on the road. They played a good TCU team right up until the final buzzer. Let’s look ahead to a team that might be playing just as thin as the Pokes on Saturday. Kansas comes in ranked 13th in the AP top 25 poll. The Jayhawks have endured a tumultuous year that has seen forward Silvio De Souza suspended by the NCAA and the injury list has been getting longer as of late. 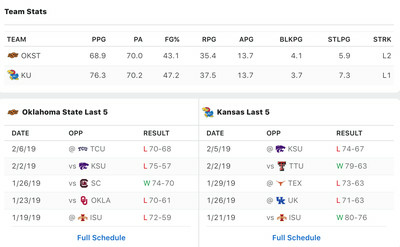 Kansas went 11-2 in its non-conference schedule before getting out to a 6-4 start to Big 12 play which is tied for fourth in the conference and one-and-a-half games behind Kansas State for the conference lead. All six of the Jayhawks losses this season have come on the road. Kansas is playing as shorthanded as it has been this season. The Jayhawks have just five players available that average more than 10 minutes per game this season. OSU could take advantage of that given that it is more adjusted to playing shorthanded. Oklahoma State hasn’t won back-to-back games in Allen Fieldhouse since a four game win streak from 1960-1963. No team has beaten Kansas more than Oklahoma State’s eight wins over the Jayhawks since 2008. Despite last years’ win at the Phog, Kansas is 61-12 against the Pokes all-time at Allen Fieldhouse.